ALBERTA, Canada – Worker rights advocates are demanding an overhaul of Canada’s caregiver program saying the pilot program has not improved but has maintained an abusive system for the sector. The Canadian federal government is eyeing review of the current program which is set to expire in November 2019. The program was rolled out in 2014, the implementation of which was criticized for lack of consultation, input or direction from care workers. The call was made during the launching of a national alliance of careworkers on November 18. Press conferences were simultaneously held in major cities of Toronto, Edmonton, Vancouver, Montreal and Ottawa. The coalition’s demands are backed by a report released on the same day collating narratives from some 150 caregivers and summarized the struggles of foreign care workers. 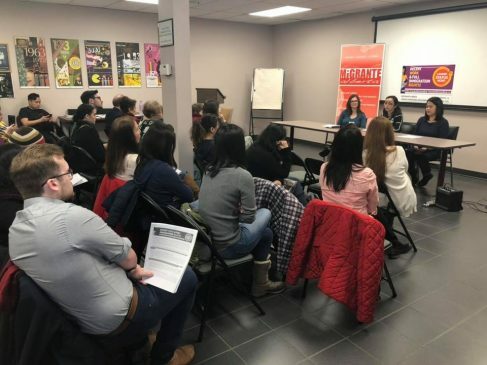 The Care Worker Voices for Landed Status and Fairness report magnified how Canada’s current system for hiring foreign care workers continues to fail the sector in terms of family separation, low wages, abusive work environments and issues with path to permanent status. The report revealed that 95 percent of the care workers suffered most from family separation brought on by being employed abroad. It noted an average of 8,000 care worker permits issued annually since the pilot program was implemented in 2014. The caregivers came tied to specific employers. “This is not integrity, it is not ethical, Canada must do better,” she added. Why Canada’s caregiver program attracts many caregivers is due mainly to its promise for permanent status, not only for the worker but also for their family. But since the new pilot program, observers such as the Coalition for Migrant Worker Rights Canada (CMWRC) – had noted a steep decline in care workers being granted and their dependents permanent residency. Only 1,955 care workers and dependents were granted permanent residency in the first 36 months under the current Caregiver program, CMWRC noted on its website. “This is in stark contrast to the average 10,740 care workers and their dependents receiving permanent resident status every year under the previous Live-In Caregiver program,” it added. Furthermore, at least 20,000 care workers have applied for permanent residency and are awaiting decision on their application while others are unable to apply because of new requirements, according to the group. “Care Workers do the critical work of raising families, caring for an elderly population and ensuring dignity for those who are sick and disabled, without us the economy doesn’t work, yet we get low wages, long work hours, unsafe housing and constant stress” said Cynthia Palmaria from Migrante Alberta speaking in Edmonton. Jocelyn Amba, a member of Edmonton-based Association of Careworkers in Alberta, entered into Canada under the new pilot program in 2016. “It is about time that Canada creates a care worker program that will truly benefit them,” her group said. Amba has passed the required language test – one of the conditions care workers have to meet when applying for permanent residence. “As Canada’s population of children, seniors and those of high medical needs grows, the demand for home care and care workers will naturally increase,” Amba said. “Majority of women and men who do the daily task of attending to the basic needs of those who need assistance are care workers from other far away countries – we are mothers, wives, sisters or daughters back home,” she said. She said that despite the work they do, caregivers are not given the credit and respect they deserve. “Most people have the ability to change jobs when they have a bad employer, or celebrate their children’s birthday, or sit by their parent’s bedside when they are ill, or be able to take a day off when they are sick, these are basic human rights, and that’s all Care Workers are asking for,” says Evelyn Mondonedo of PINAY Quebec in Montreal. “We need to have an open work permit to protect ourselves from abusive employers. An employer specific work permit encourages inhumane treatment – in our pursuit of 24 months completion to qualify for permanent presidency, we endure disrespect and belittling insults,” said Amba. Besides an open work permit, the newly-formed coalition of care worker rights advocates across Canada would like to see permanent status upon arrival granted to the care workers. The coalition is also proposing the ability to apply for permanent status after a year instead of two years, removal of caps on yearly applications for permanent residency, and removal of English language requirements. The current program also requires care workers an equivalent of one year Canadian post-secondary education to be eligible for permanent residency which critics say is not achievable for most care workers given their work arrangements. With less than a year left in the program, the care workers are living on the verge of uncertainty according to Marco Luciano, director of Migrante Alberta. “It is time for the Canadian government to step up and start caring for the care workers. Many of them will end up losing their work permits and fall into cracks,” he said. For Amba and other care workers, if the government is serious in changing the program for the better, listening to them would be a place to start. “We believe that we will all need care in the future, if not now already. We will be old, weak and sick in not so distant future. We hope that whatever decision will be made regarding the caregiver program, we all reap the good fruit and not bear the consequence,” she said.